How can astronomers find black holes if they cannot see them? The key to finding black holes is their immense gravitational power. One way to find black holes is to observe matter moving or orbiting at much higher speeds than expected. By carefully mapping the motion, and then applying Kepler’s third law of orbital motion, it is possible to measure the mass of an object even without seeing the object itself. The intense gravitational field of a black hole can also produce a tremendous amount of light nearby and around itself, even if the hole itself is dark. 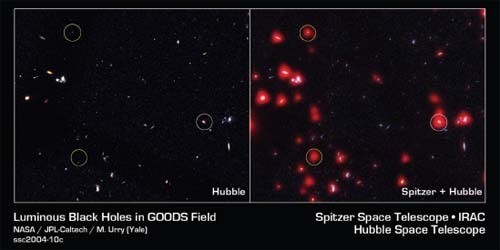 Matter falling into a black hole runs into a lot of other material that has collected around the hole. Just as a meteorite or spacecraft gets hot as it enters Earth’s atmosphere, the in falling matter gets hot from the frictional drag, too, sometimes reaching temperatures of millions of degrees. That hot material glows brightly and emits far more X-ray radiation and radio waves than would normally be expected from such a small volume of space. By searching for these tell-tale emissions, astronomers can deduce the presence of black holes even though they cannot see the holes themselves.